It hasn’t been proofread, and it is possible (though very unlikely) that we might change some of the content between now and full release. To be honest, if I was offered a preview of the first part of a novel I was waiting for, I would decline and wait a few more weeks to enjoy the whole book in one sitting, but I suspect some of you think otherwise! 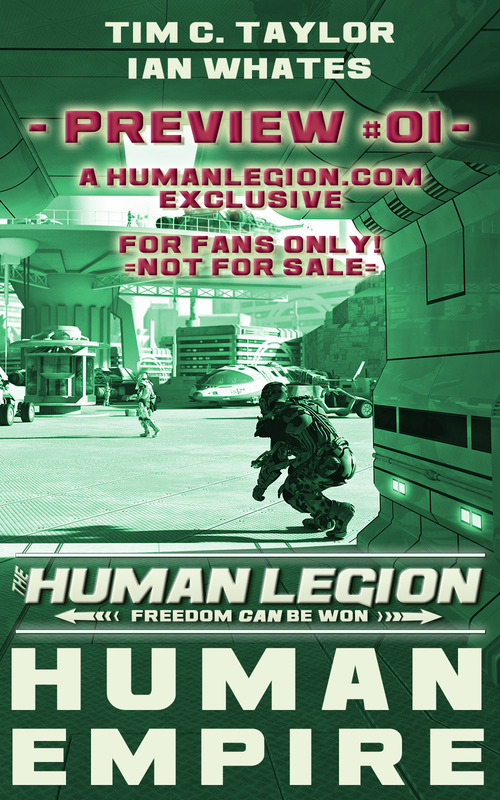 This is the first co-written Human Legion story. Ian and I wrote whatever needed writing next, and then sent our rough drafts off to the other to finish off. So we’ve both worked on all of what you can see here. You’re welcome. Thanks for your support, Chris. Been waiting for the next installment ! Happy days. Enjoyed the first three. Happy days indeed! Thanks, Dennis. Love the sample! Thanks! Looking forward to the release! Sample? Preview? Humm … of course I’ll take a preview of the book … and reread when the book comes out. Such dedication 🙂 Thanks, Tim. A sample is on the way. Really loving the series so far and really looking forward to the next book! P.S. Please don’t send me a sample, I’d much rather wait for the finished article. Thanks, Aaron. I’m feeling really good about the next book. I’m sure it will be worth the wait, but you’ll be able to decide that for yourself before too long. I am glad to here that the next instalment is well on its way. Will it be available on Kindle from the release date? I have been eagerly awaiting this one after coming across the other three by accident and was hooked. Thanks for a damn good read. Graeme, I love to hear you’re enjoying the series. Thanks for letting us know 🙂 The next book will come out on Kindle and paperback. If one edition precedes the other, it will only be by a couple of days. Ian and I haven’t quite tidied the first draft, but if that goes well over the next week, we’re planning on a mid-September release. Really enjoy the series. Thanks for the good reading time. I’m delighted that you’ve enjoyed the series, Juanita. Thanks for letting me know. Did you want to see the preview? Nice, advance info is always great. Look forward to all reading new stuff. Have a great day. I cant wait fore the next book. The series so far has been brilliant, I’ve read each book from front to back in one session even through the night. What can I say, Marten? It has been a privilege to write books for you that keep you reading into the night. I hope I can cause a few more late nights with the rest of the series 🙂 Thanks, Tim. You are right, I’ll wait for the book. Thanks for your time writing. Just finished reading the first 3 books in a few days and am hooked. Thank you for a great read that has me hooked! Please, please send it to me. Should be on its way by email. Love this series! Keep up the stories. Been a while since I found a new military SF author to read that I really like. Great style. Thanks Michael. Your message has me energized for a day of writing. Actually, editing and tuning, because we’re getting close to having the fourth book ready. I hope this next one hits the right spots for you too. Tim.